Matthew Peterson: Let me ask you a bonus question real quick. Matthew Peterson: We talked a little bit about breaking in to the publishing industry. What’s some of the advice you would give to a new author who’s trying to break into the publishing industry? James Dashner: I think, by far, the most valuable thing you can do is go to writers conferences. There’s so many great organizations, so many great conferences. And almost every leap I’ve made in my career I can trace it back to some kind of connection I made at a conference. So you know, there’s agents and editors always come to these things. You meet other authors. The way I got my agent was actually through another author that I met. 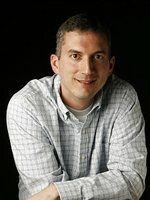 James Dashner: So those connections, combined with the obvious, you know, working on your craft as much as you can, I think that’s very, very valuable. Matthew Peterson: That’s how I got my first agent. I got Barbara Bova, who’s Orson Scott Card’s agent. Unfortunately, I was right in the thick of things, still getting my rights back and I didn’t have a second book or anything and we went our separate ways. So, I’m agentless. James Dashner: Well, you just . . . yeah, keep looking and you’ll get it, you’ll get it. Matthew Peterson: Yeah. I have my eyes on a couple of them. Who’s your agent? James Dashner: His name’s Michael Bourret. He’s with Dystel & Goderich. James Dashner: He’s incredible. Certainly changed my life forever, so . . .
Matthew Peterson: And why has he changed your life? Why would you say get an agent? What’s the big deal with agents? James Dashner: You know, he’s in New York City; he’s having lunch with editors all the time, very people friendly; he knows the industry inside and out and you know, when he signed me on, he took the measure. I was actually only a proposal: 50 pages and a synopsis, and he sold it to Random House in three weeks. And he got a really good deal. So he’s done things that I could have never ever done on my own. Matthew Peterson: Yeah, ‘cause you as an author without an agent, you can’t even talk to Random House, let alone get a book deal in three weeks. Matthew Peterson: Yeah, exactly. Agents, they do take a little cut of your money, but it’s far better, because you’re going to get a lot more because of the agent. James Dashner: Yeah, they’re worth every single penny you pay them.